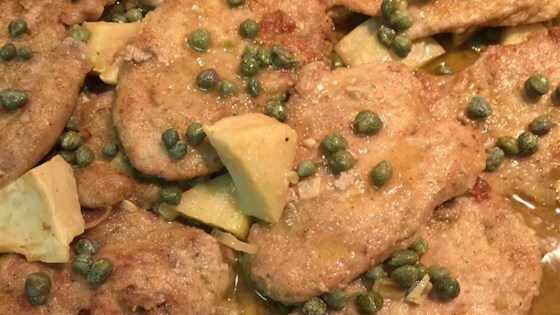 "After eating chicken piccata in many restaurants and finding many that were 'greasy,' I came up with this recipe through much trial and error. It has wonderful flavor and is even better the next day! I like to serve it over angel hair pasta or linguine." Mix together the flour, garlic powder, salt, pepper, and Italian seasoning on a plate. One by one, dredge the chicken pieces lightly in the prepared flour mixture. Heat the olive oil in a large skillet over medium-high heat. Cook the chicken pieces for 2 minutes per side, or until nicely browned. Remove from the skillet and set aside. Using the same skillet, cook and stir the garlic and onion until translucent, about 5 minutes. Pour the white wine into the skillet, turn the heat to high, and cook until the wine reduces by half, 4 to 5 minutes. Add the chicken broth, lemon juice, artichoke hearts, reserved artichoke liquid, and browned chicken to the skillet. Reduce the heat to medium and cook until the sauce thickens, about 20 minutes. Stir in the capers and butter. Savory chicken piccata with artichokes in a white wine sauce. Very good. The sauce was great. The only change I made was to add a chicken bouillion cube for a bit more flavor/salt. Thanks. Love artichokes!! !